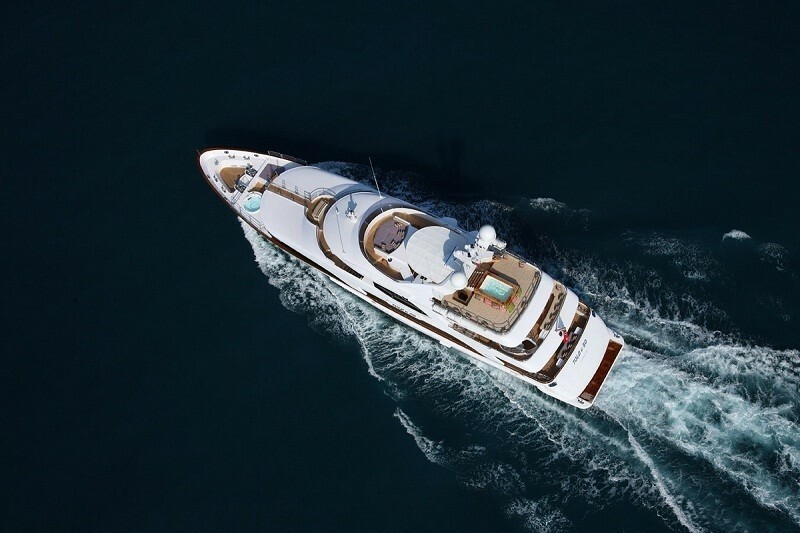 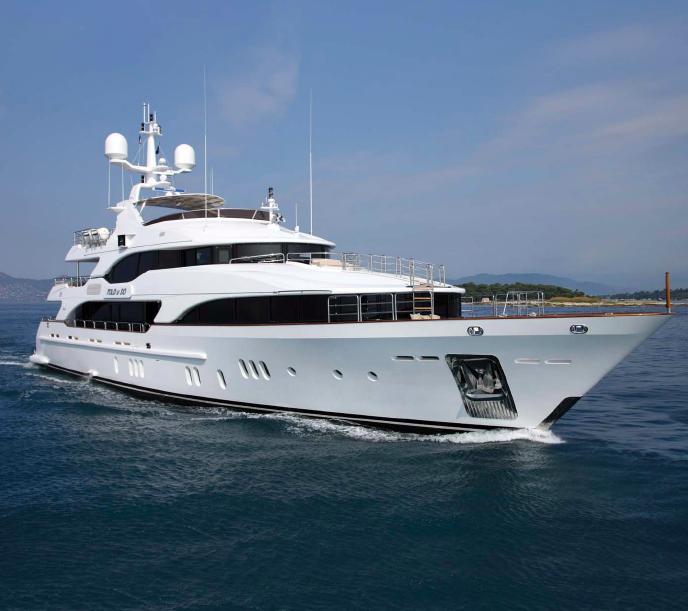 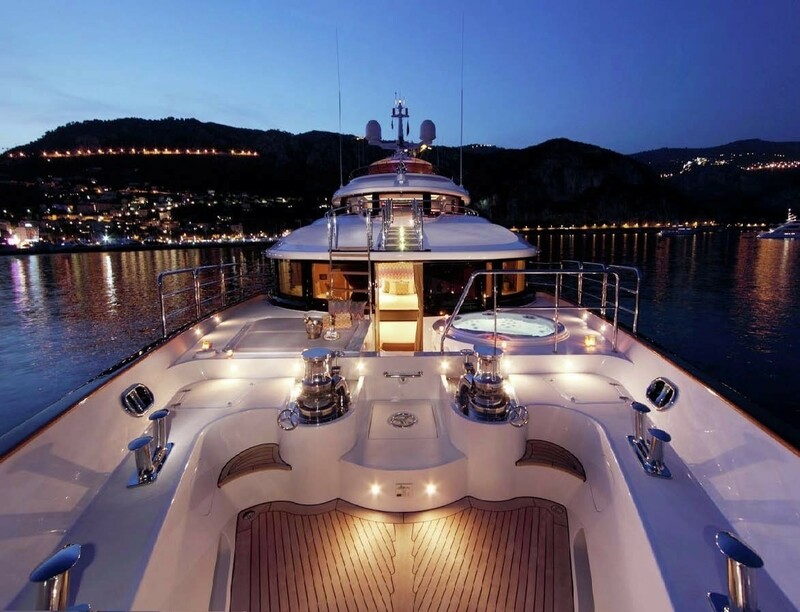 Motor Yacht MOKA is a 145ft long Benetti superyacht and the 16th from the Benetti Vision series. 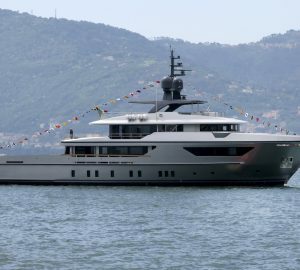 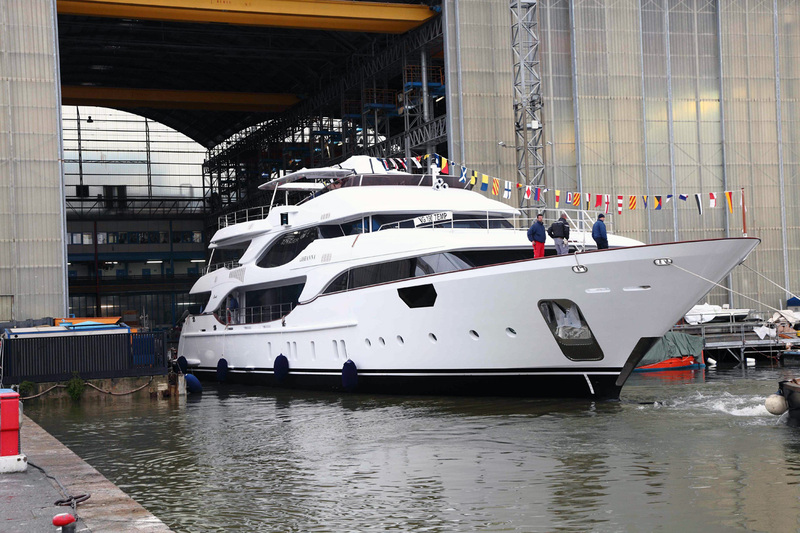 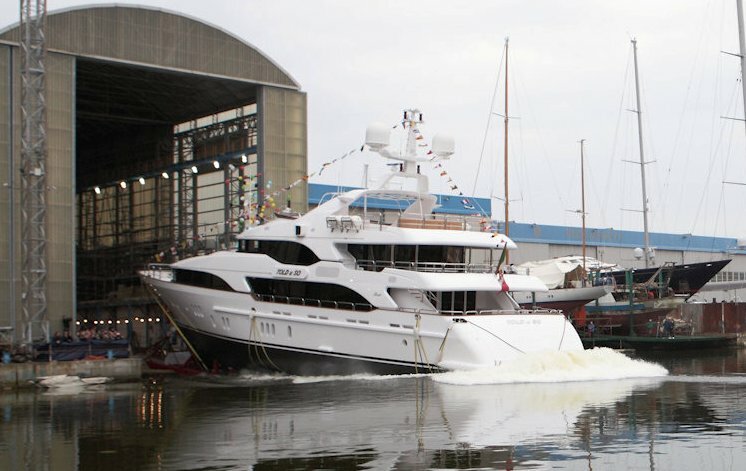 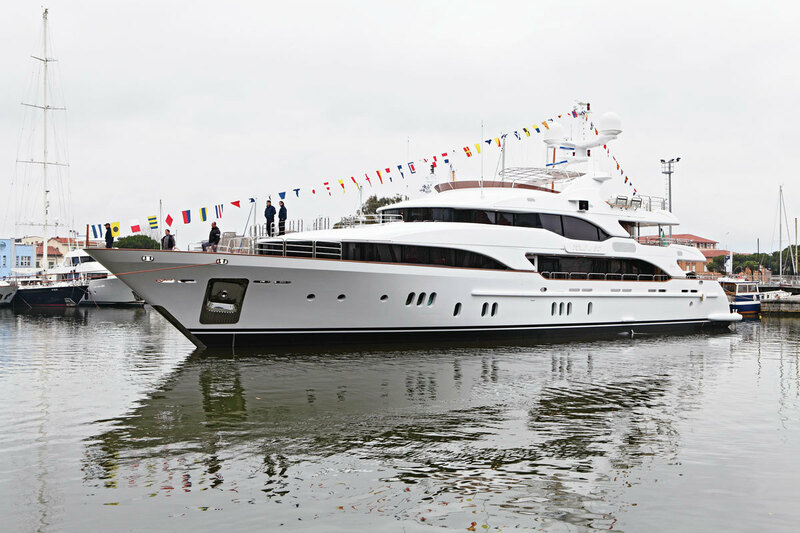 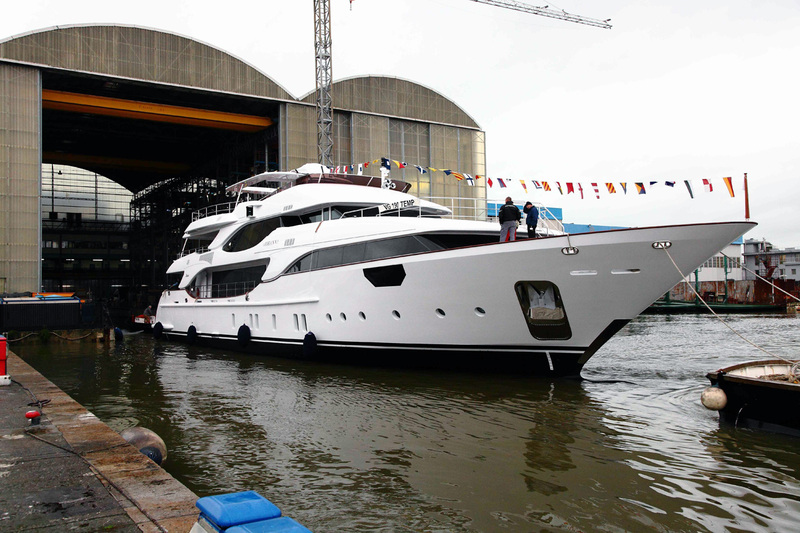 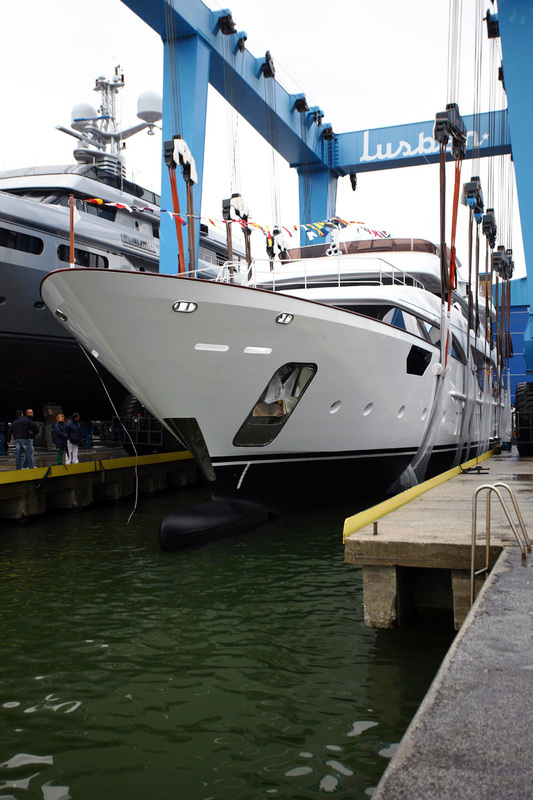 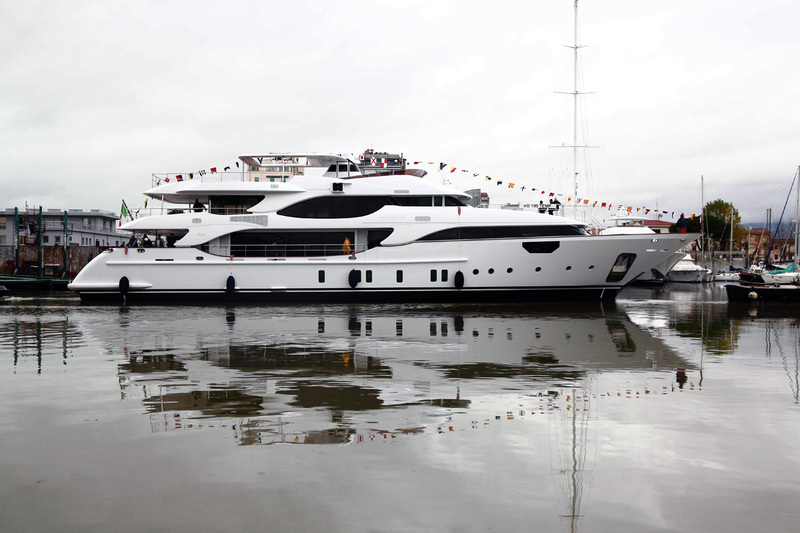 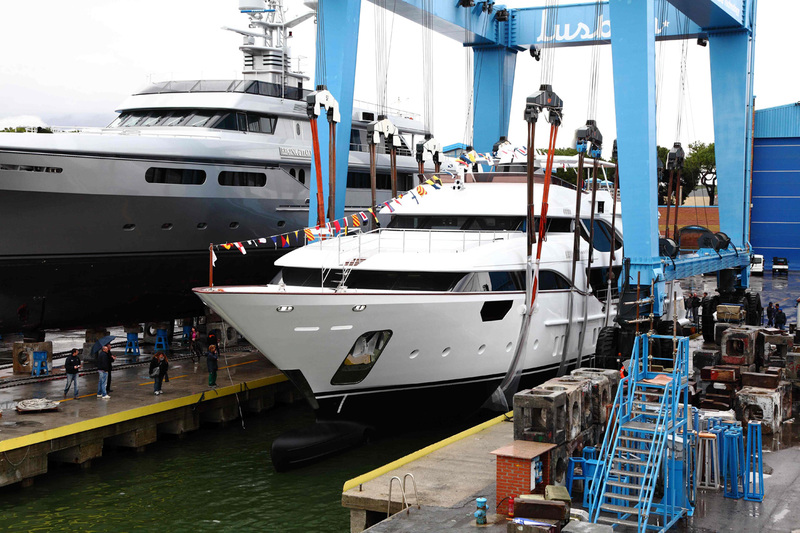 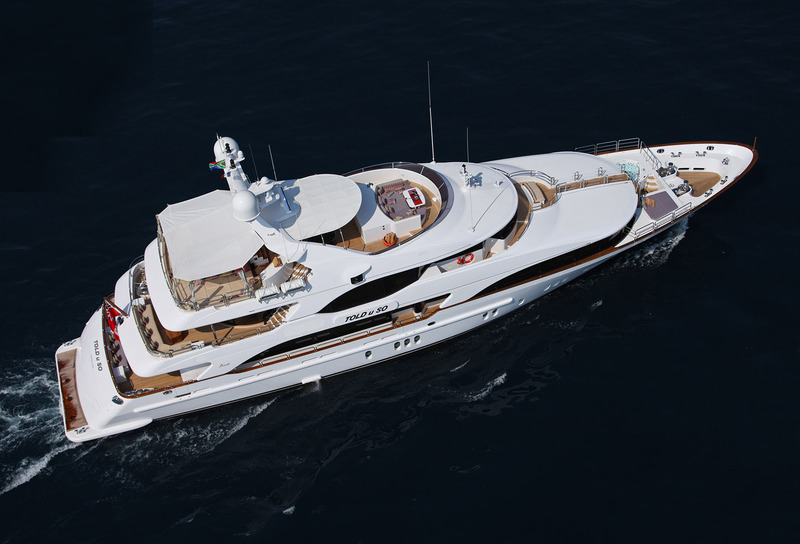 MOKA yacht was launched in 2011 in Viareggio. 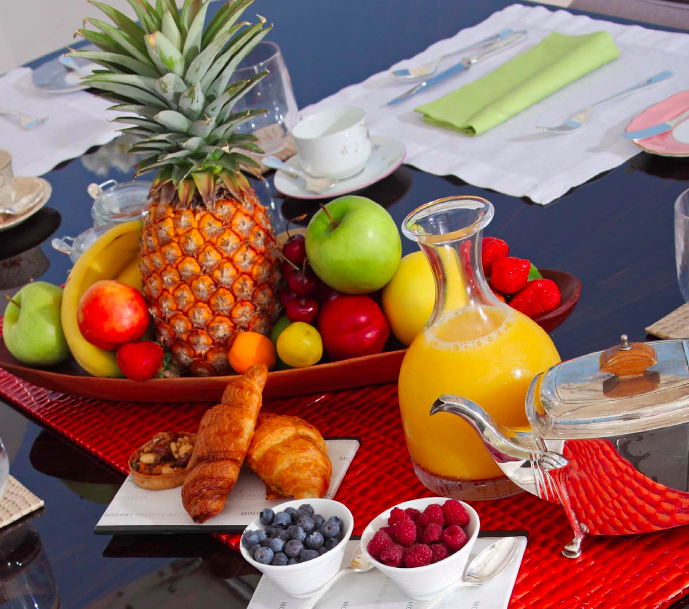 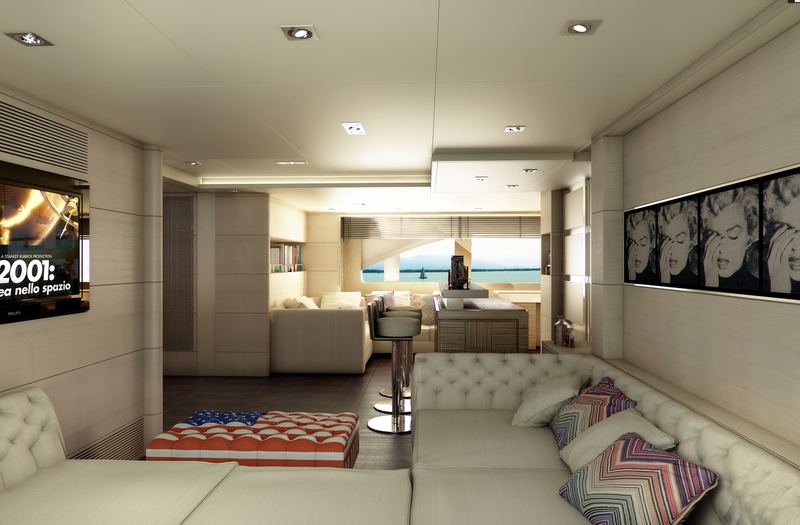 She is a custom creation of international entrepreneur, hotelier and designer Kirk Lazarus, featuring a combination of exceptional quality, elegance and luxury. 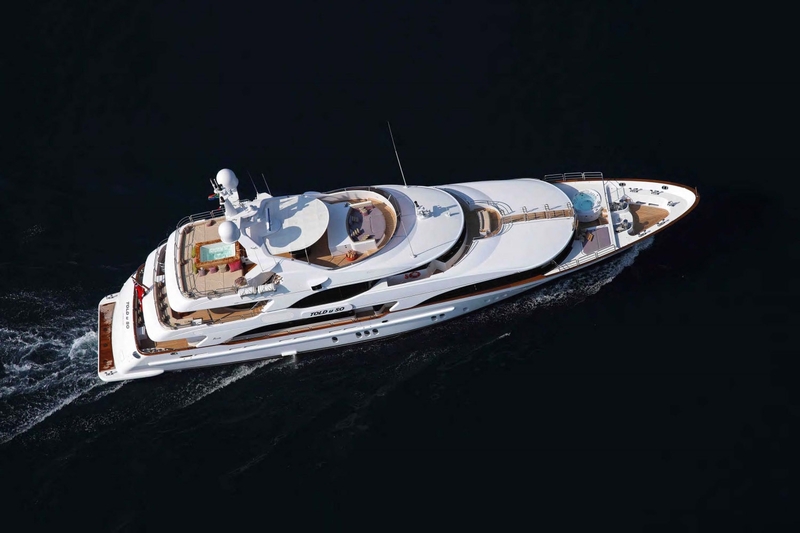 The 145ft Benetti Vision motor yacht MOKA (ex ‘Told U So’) features incredible detail, sophisticated, original and carefully cultivated design elements that have become synonymous with the Molori brand. 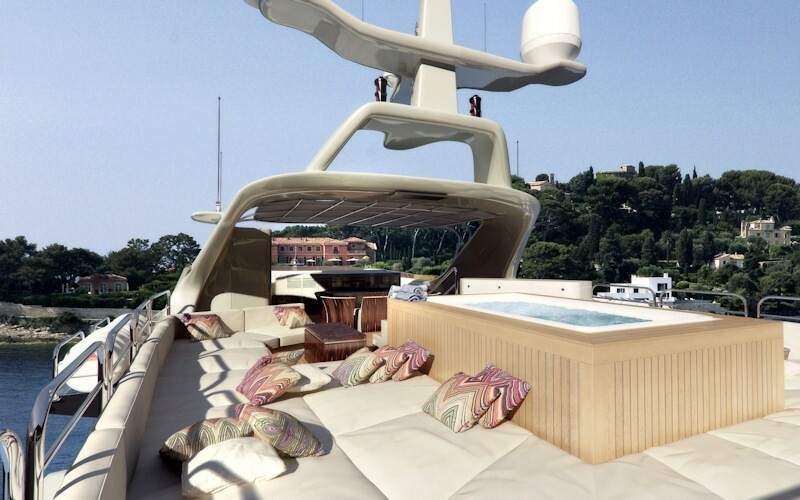 ‘Told U So’ yacht features an effortless transition between the indoors and outdoors providing an authentic connection with the natural environment. Accommodation onboard of the charter motor yacht is provided in five lavish and spacious cabins, each with their own distinct style with an eclectic combination of design elements. 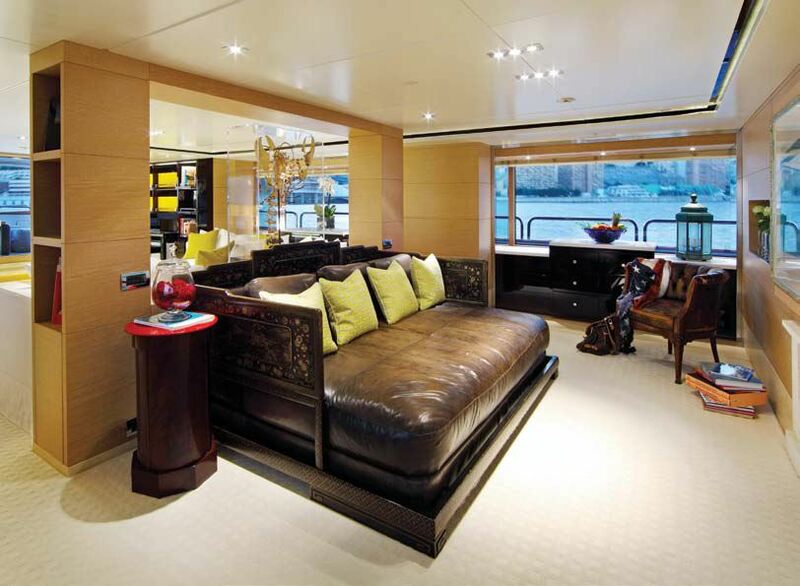 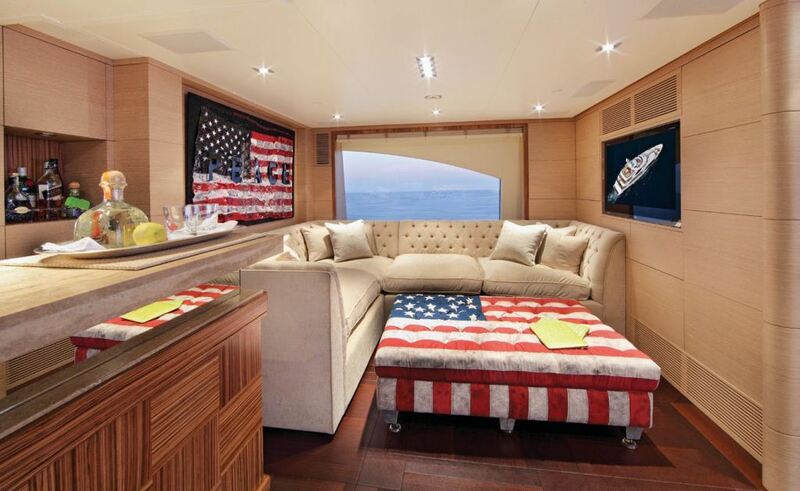 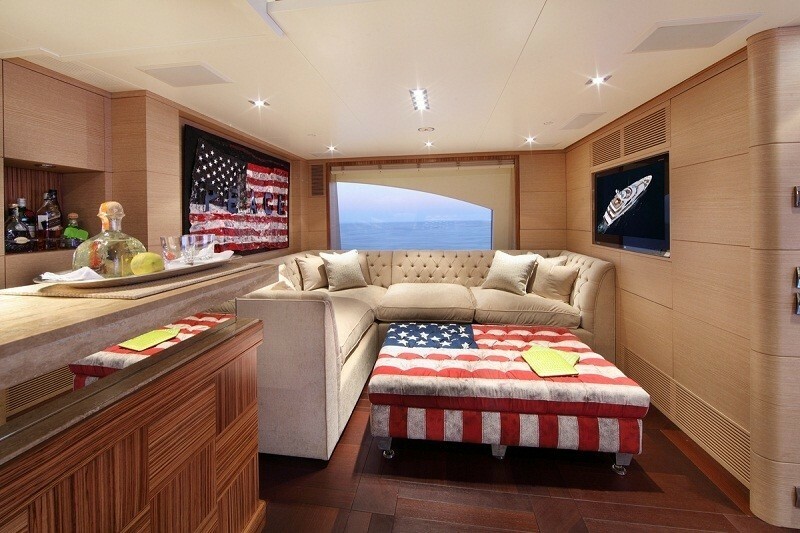 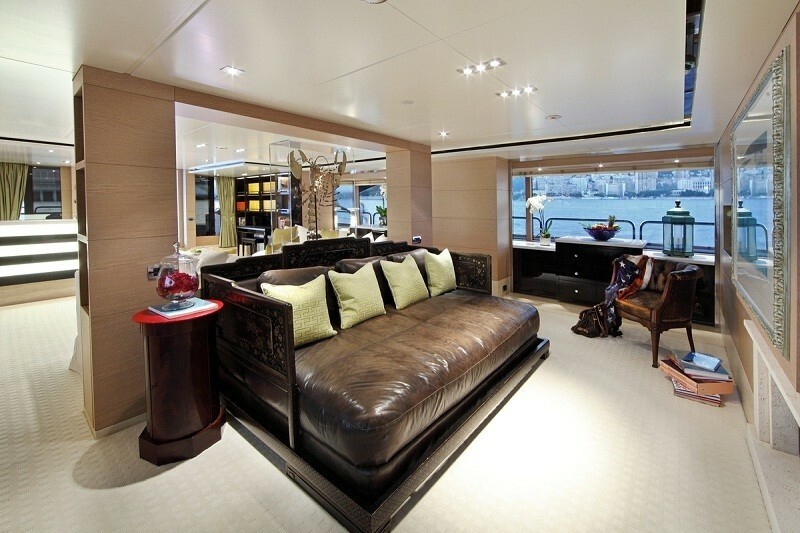 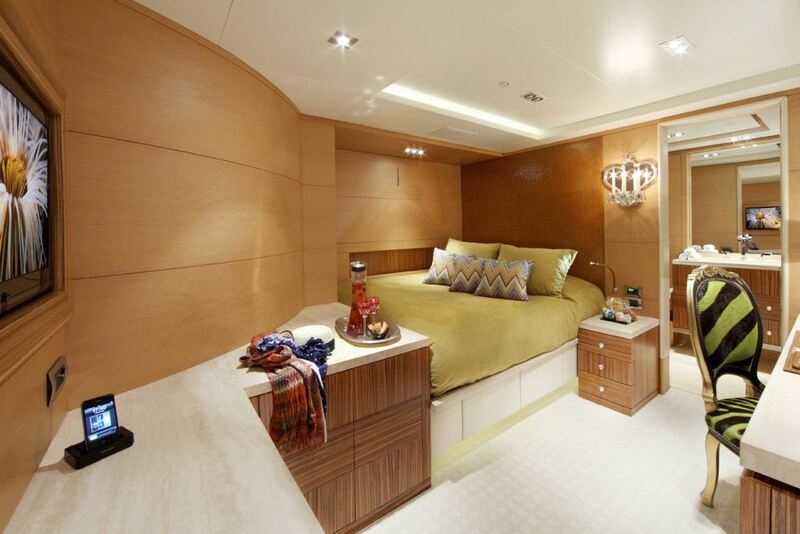 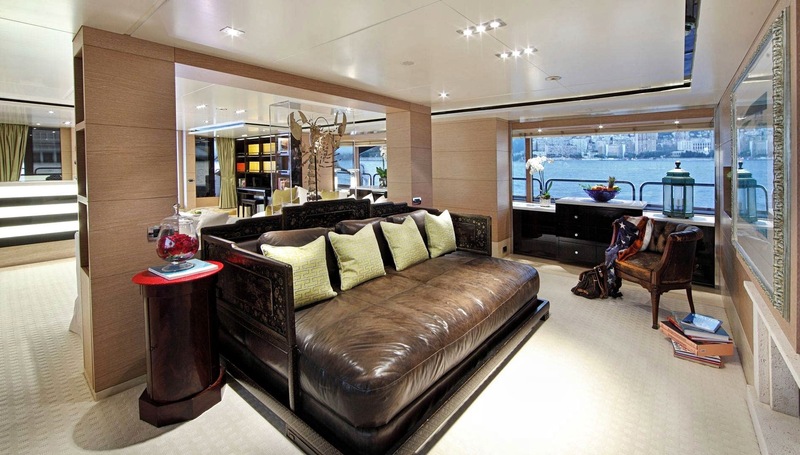 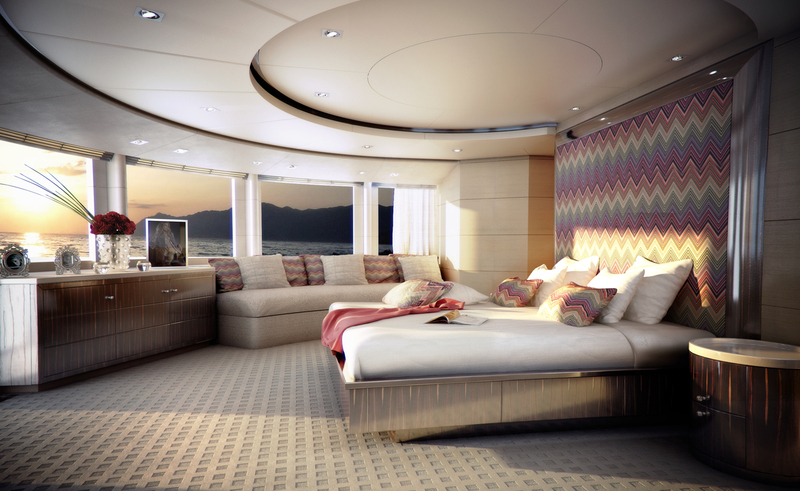 The Master Suite is located on the main deck forward and has an 180-degree view. 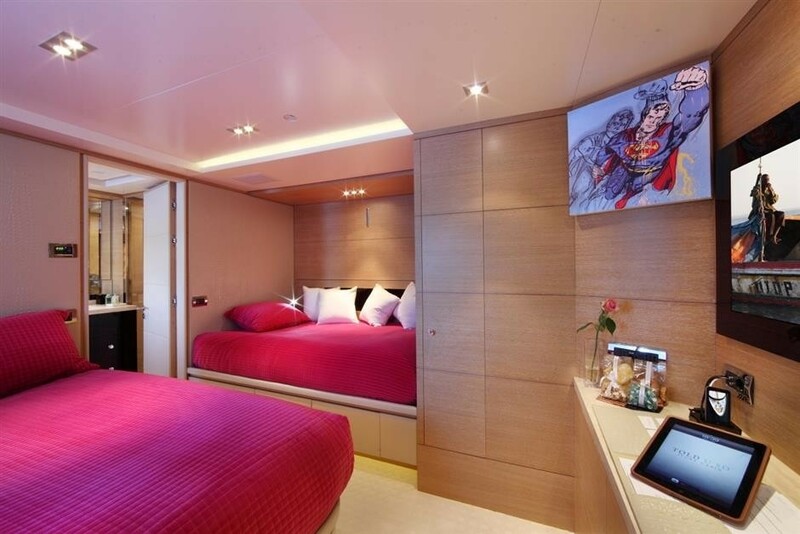 There is a separate his and her’s bathroom, a private study, an en-suite screening room and private sun terrace with a six-person Spa Pool. The guest’s cabins are equally as luxurious with customized woods, stones and fabrics that set the stage for both modern and antique accent pieces, selected from all over the world. 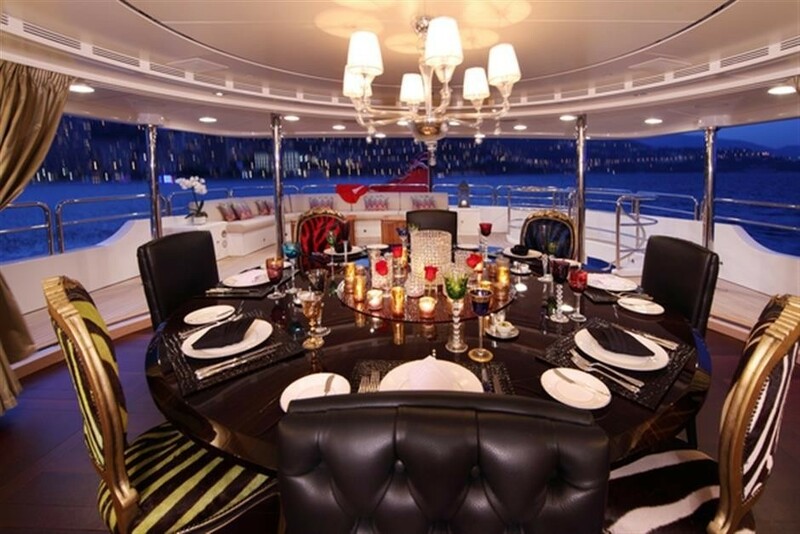 She can host up to 60 guests for cocktail parties. 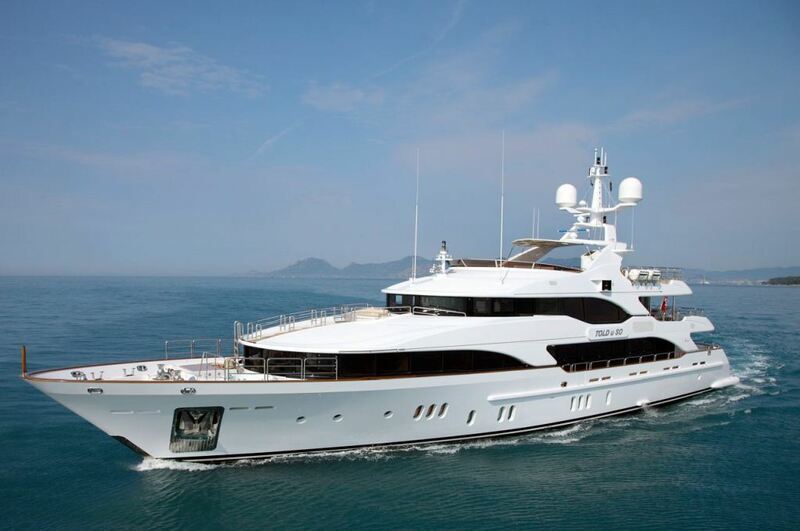 She will also accommodate up to 12 crew members. 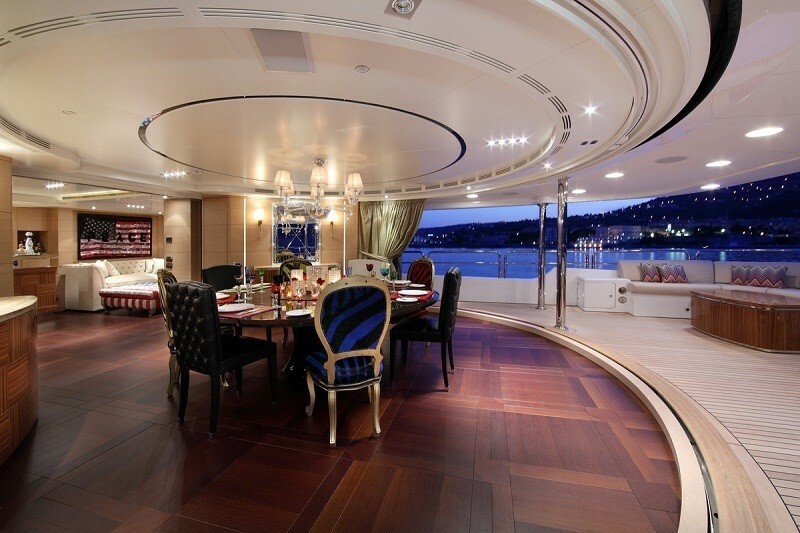 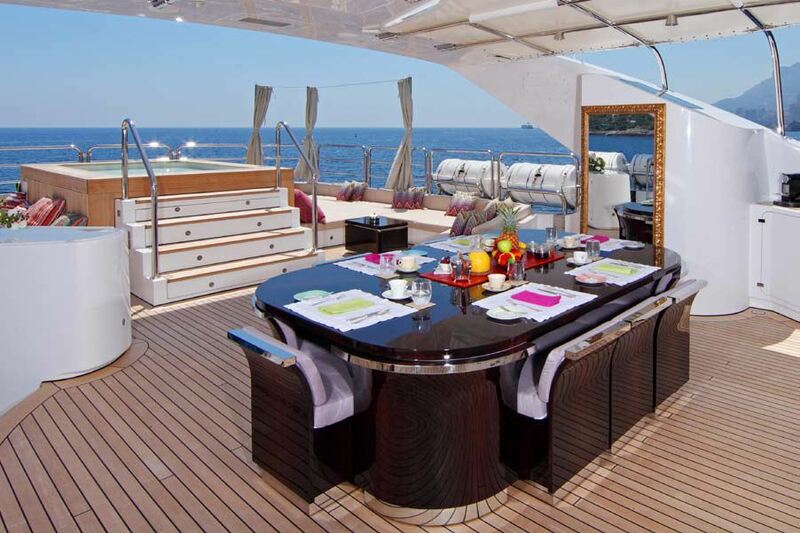 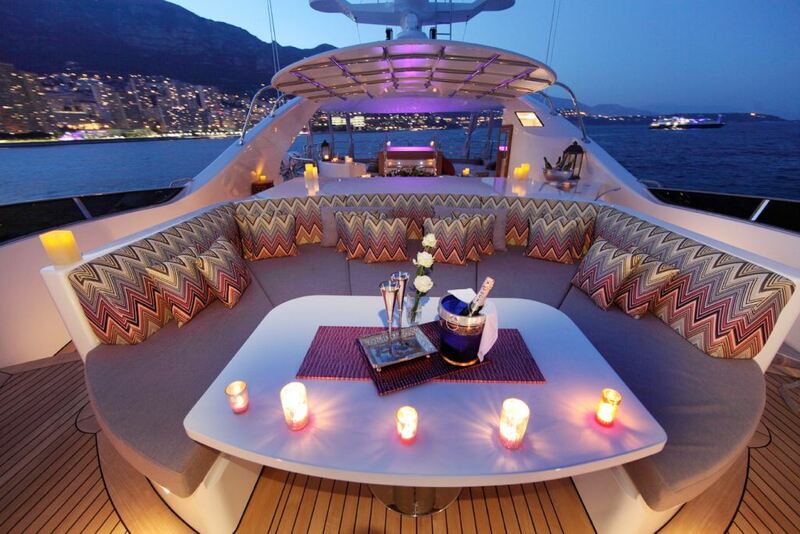 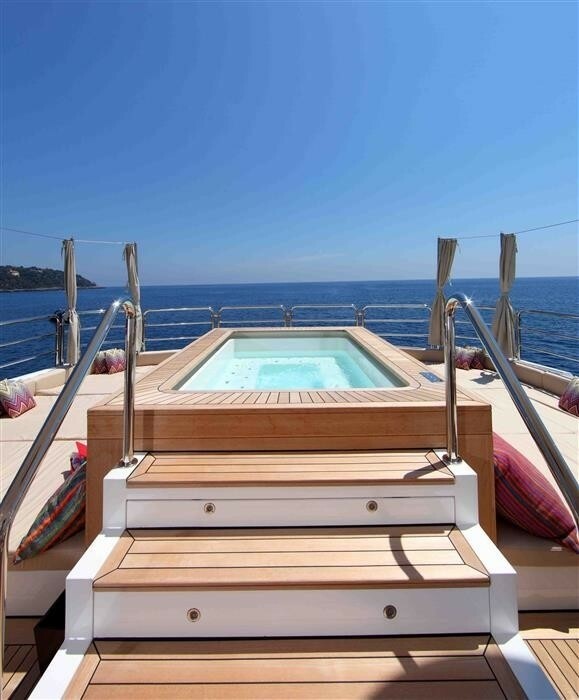 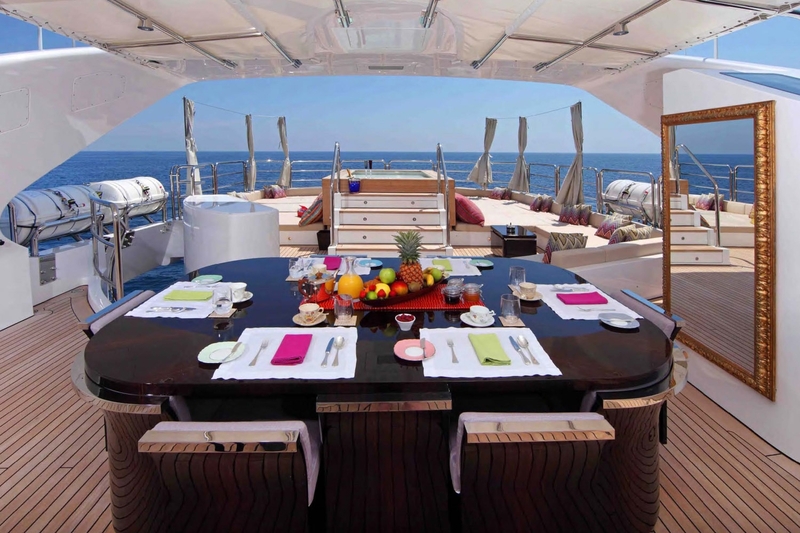 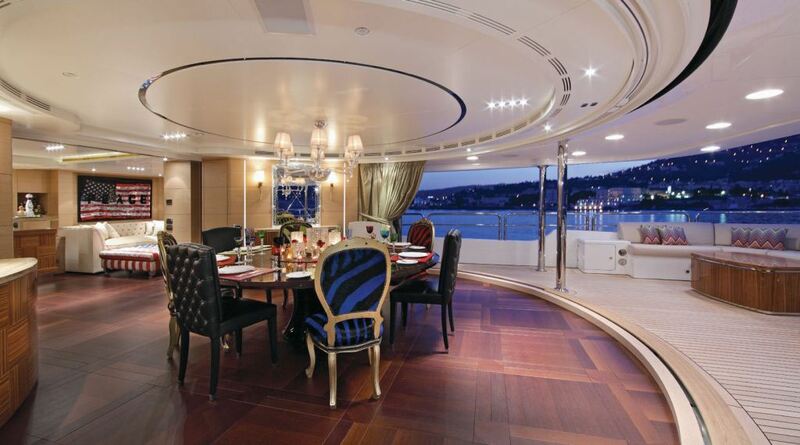 MOKA has several spaces for entertaining on each deck. 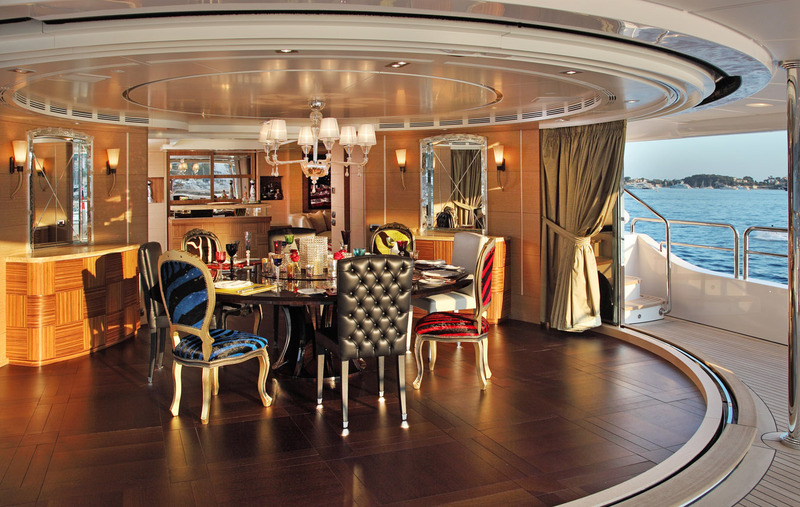 Her indoor dining area on the upper deck is elegant and easily converts into an outdoor space, thanks to retractable glass walls. 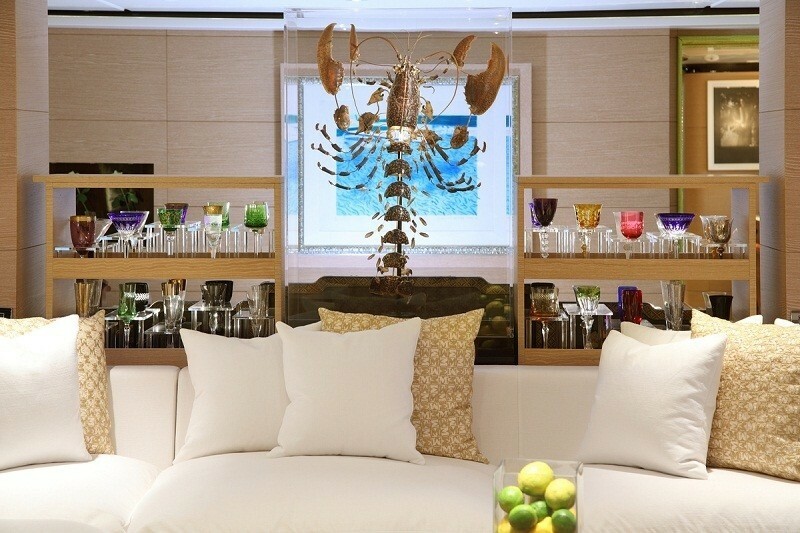 The Sky-Lounge can be transformed onto a state-of-the-art cinema revealing a wide screen TV hidden behind a magnificent art piece. 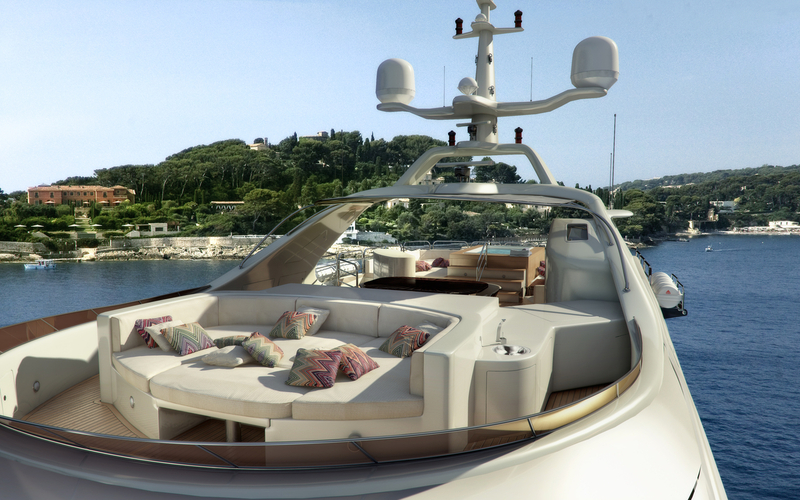 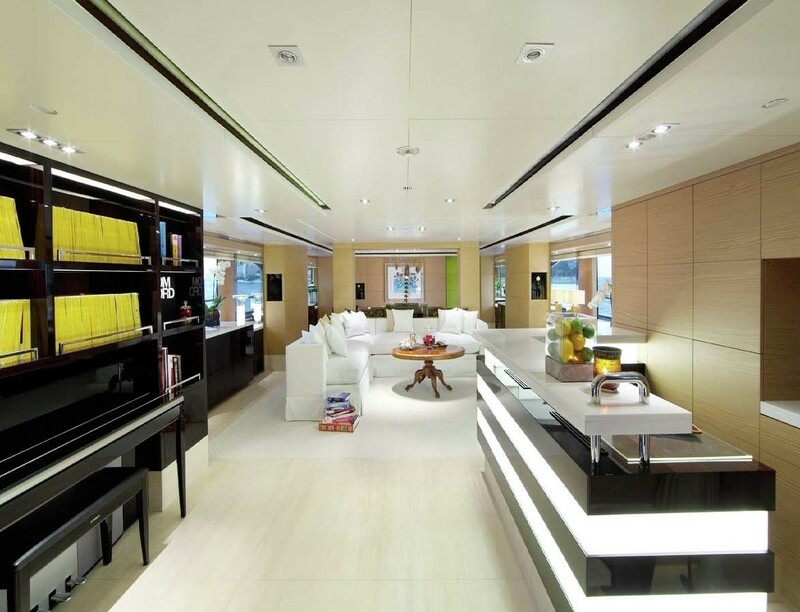 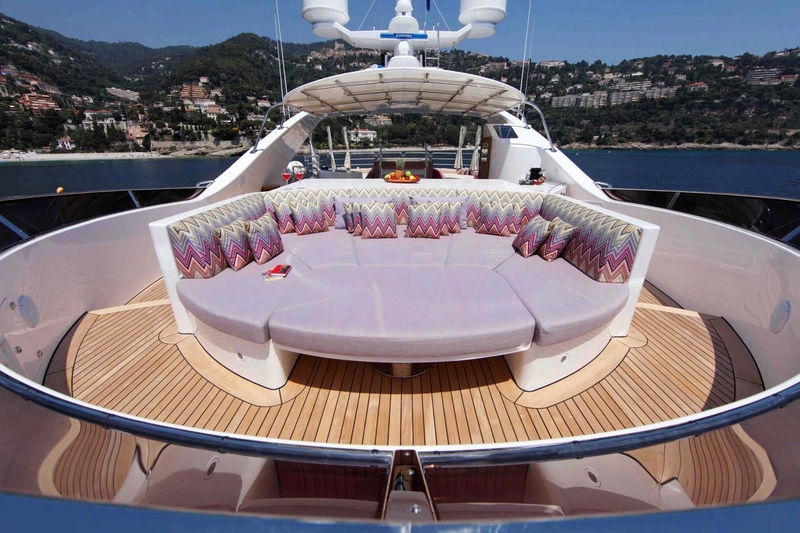 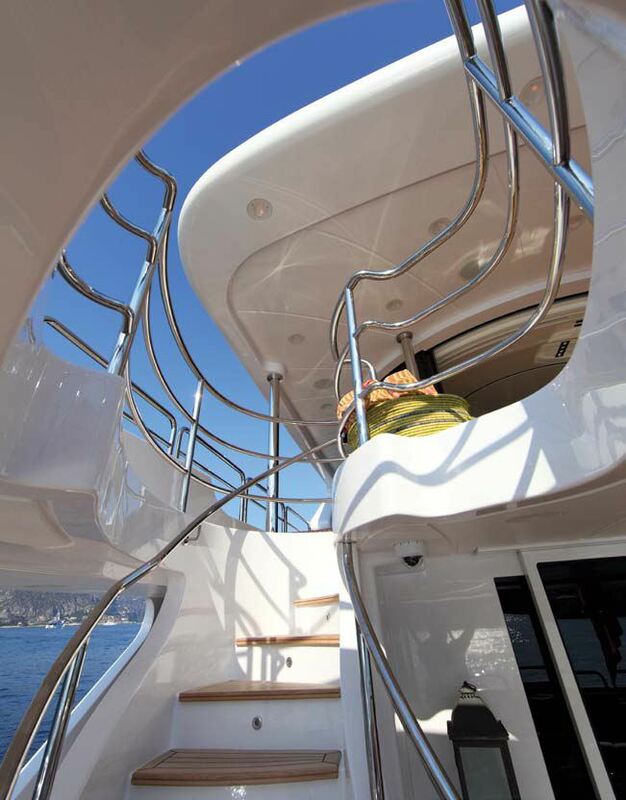 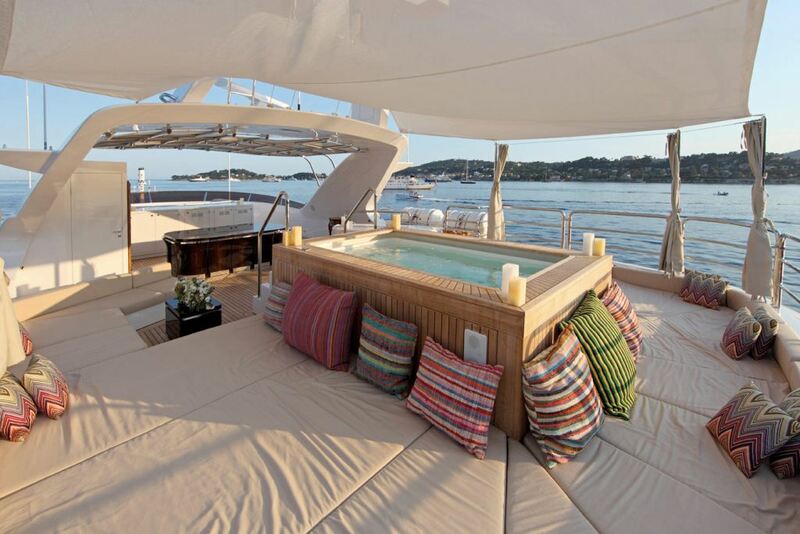 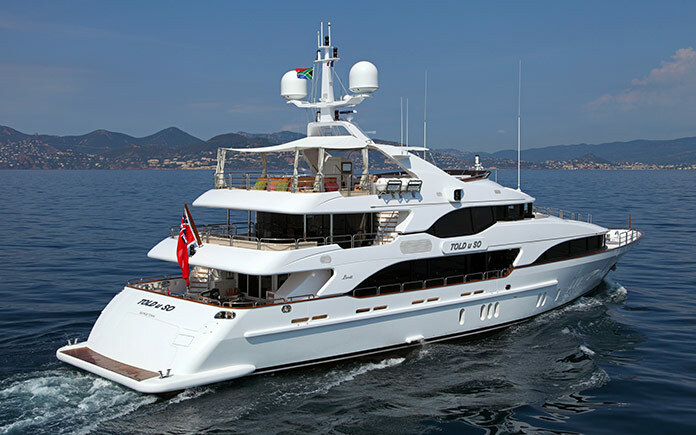 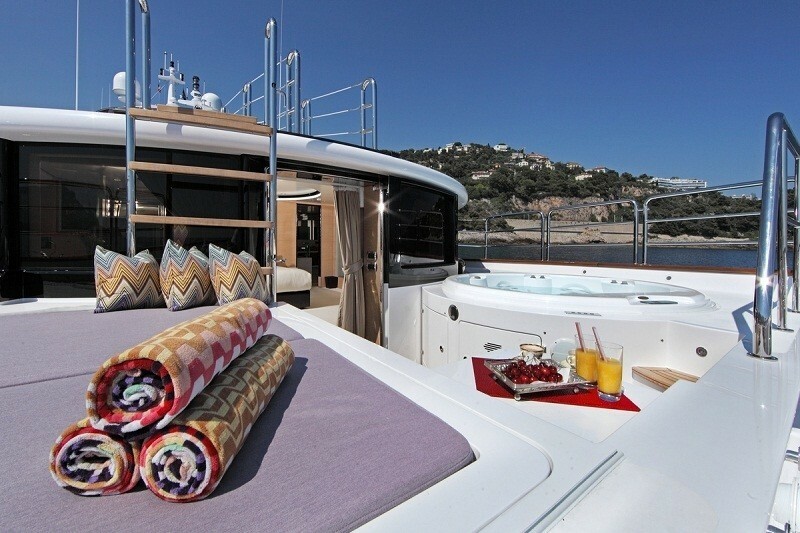 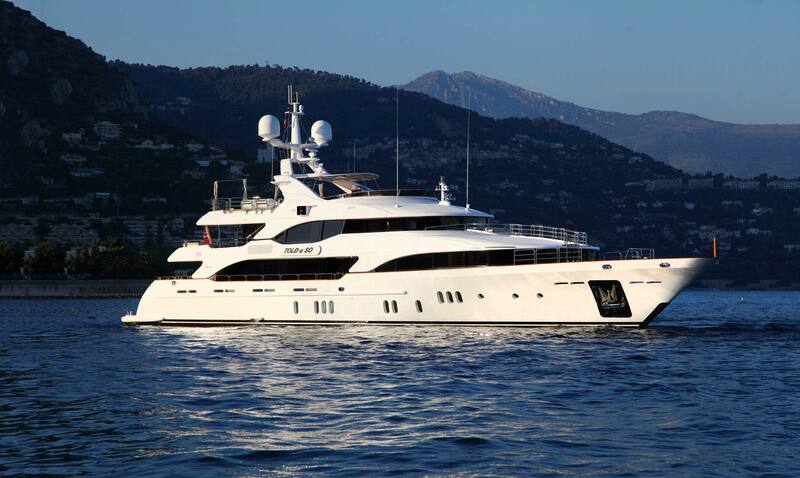 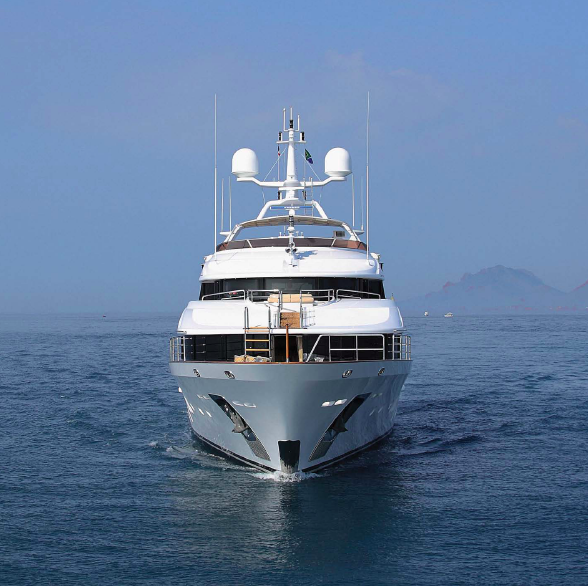 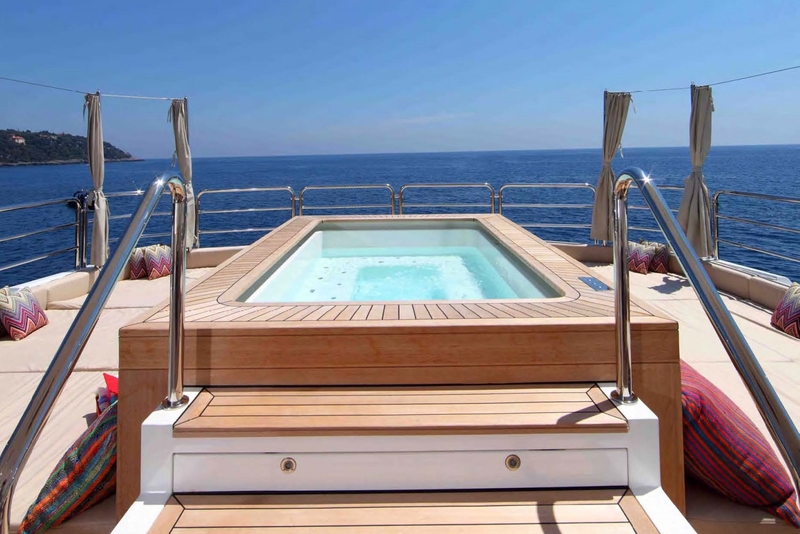 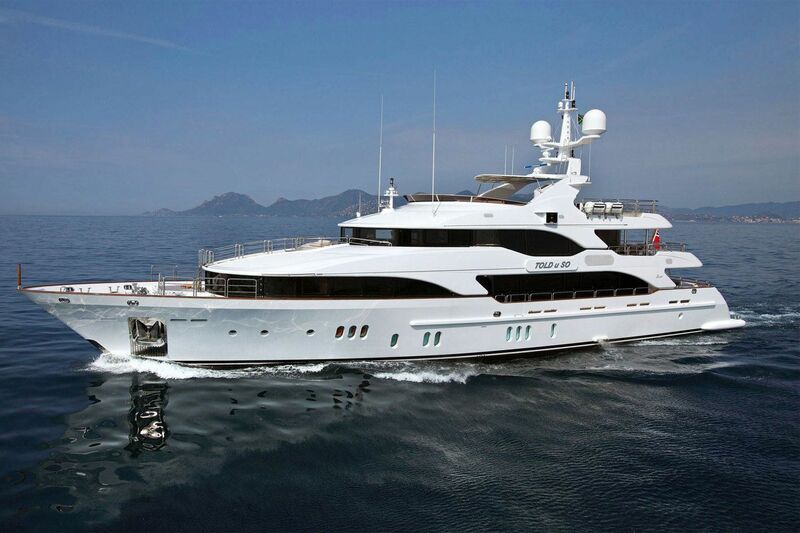 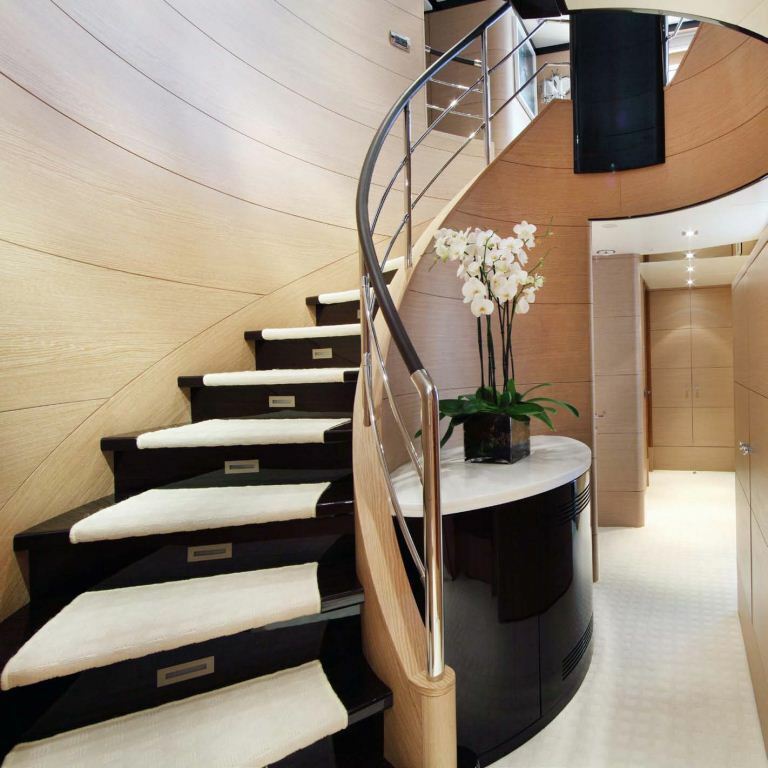 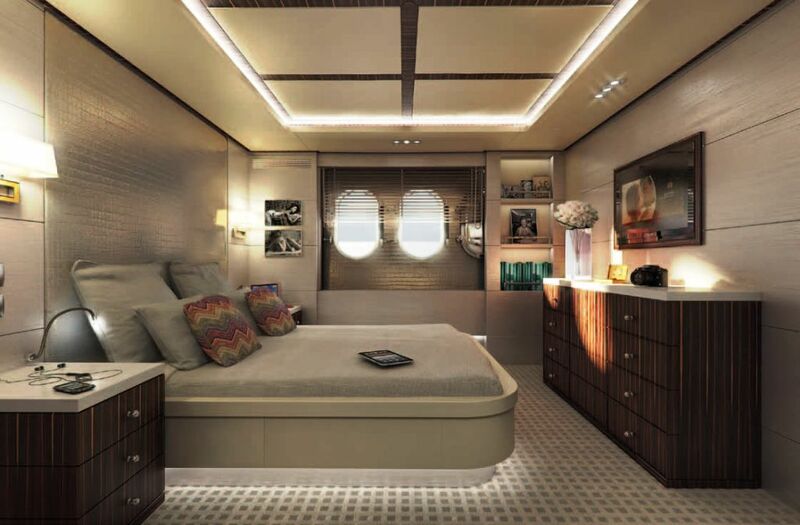 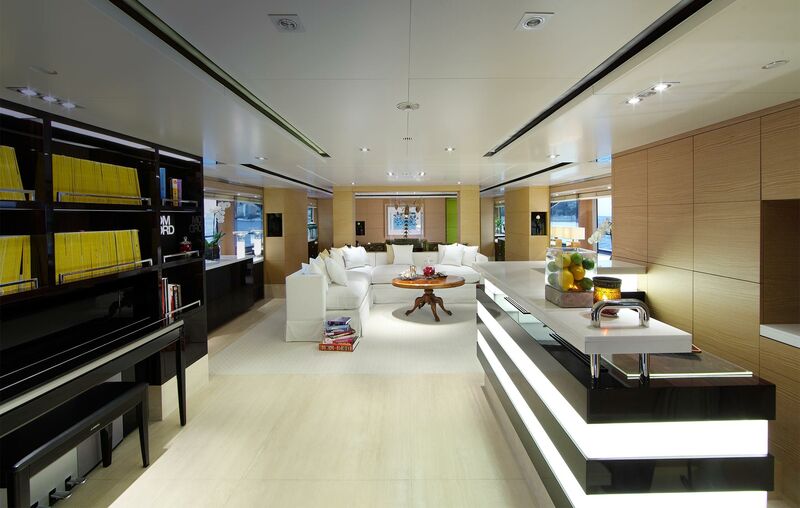 The exterior spaces on the Benetti Yacht are laid out with entertainment and relaxation in mind. 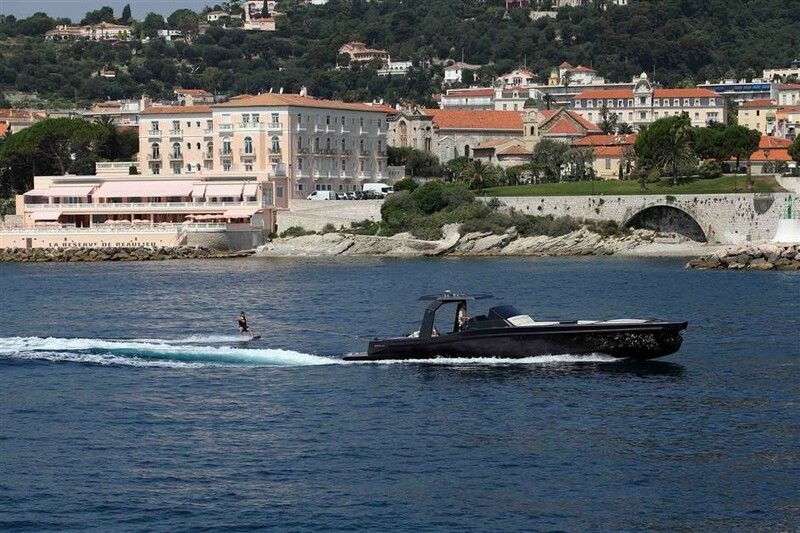 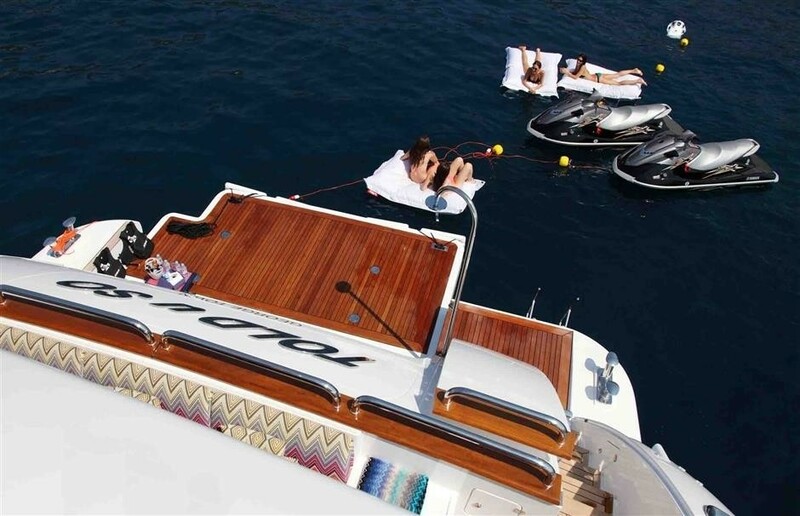 The yacht features top-of-the-line water crafts, including jet skis and Riva 33 tender. 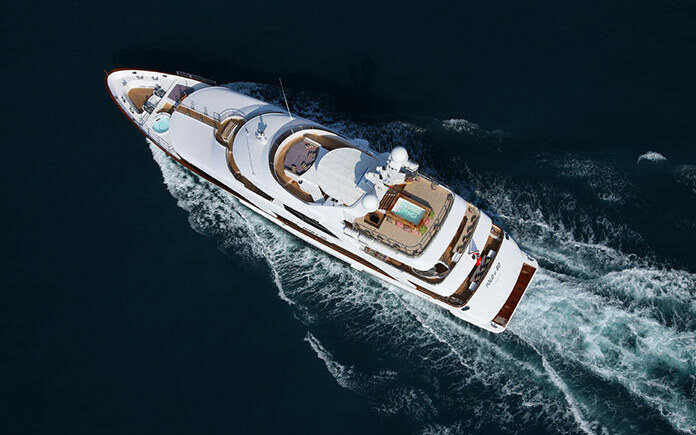 The charter experience will come with exclusive use of a private island that boasts 2 beautiful lagoons perfect for swimming and snorkeling, al fresco dining and an outdoor spa. M/Y MOKA is able to accommodate up to 10 guests in five lavish and spacious cabins, each with their own distinct style with an eclectic combination of design elements. 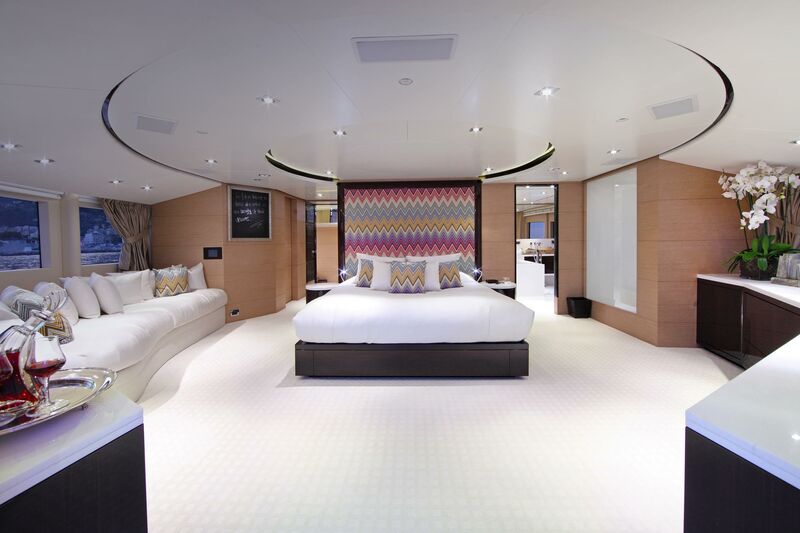 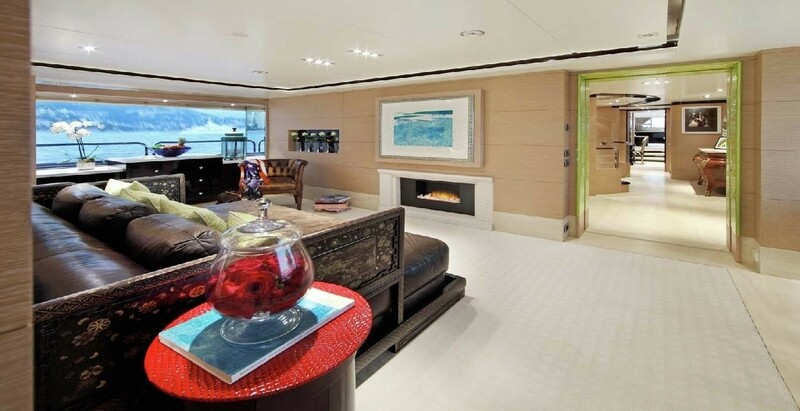 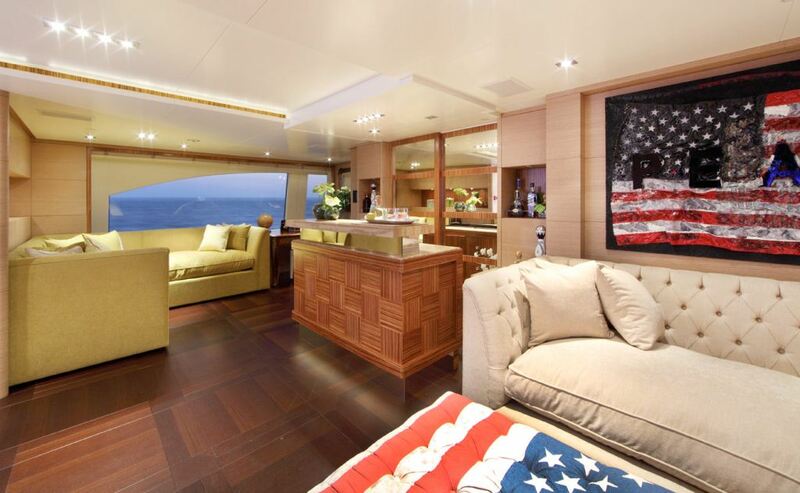 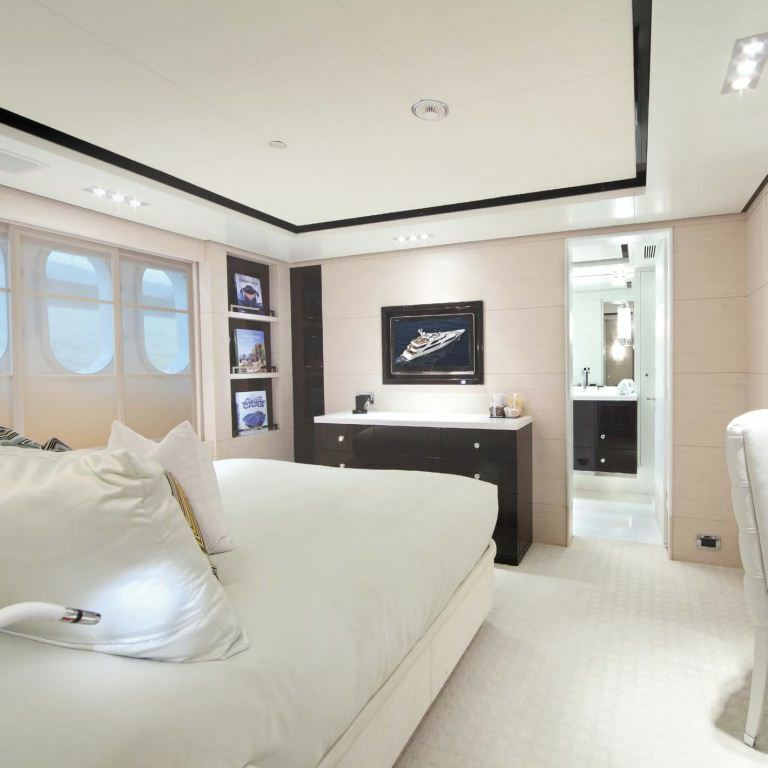 The Master Suite is located on the main deck forward and has an 180-degree view. 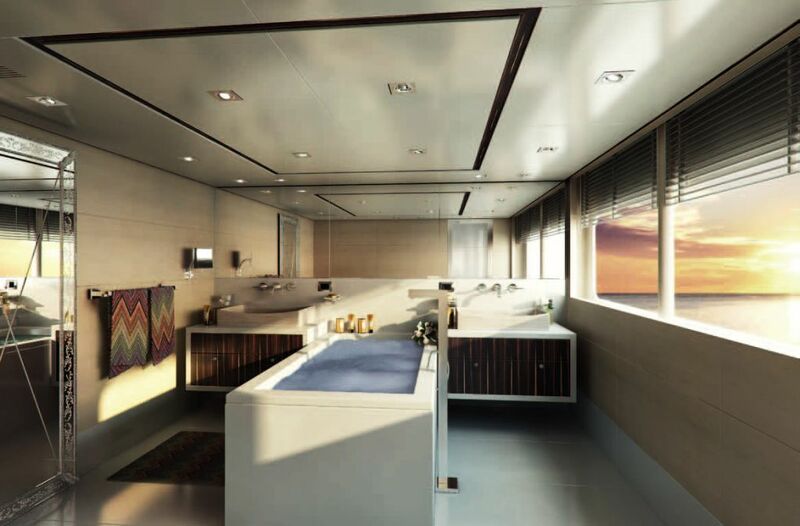 There is a separate his and her’s bathroom, a private study, an en-suite screening room and private sun terrace with a six-person Spa Pool. 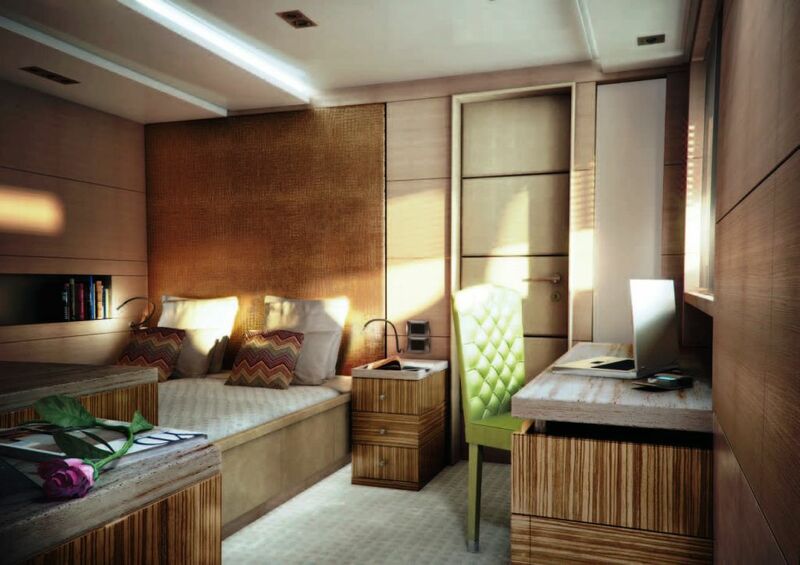 The guest’s cabins are equally as luxurious with customized woods, stones and fabrics that set the stage for both modern and antique accent pieces, selected from all over the world. She can host up to 60 guests for cocktail parties. 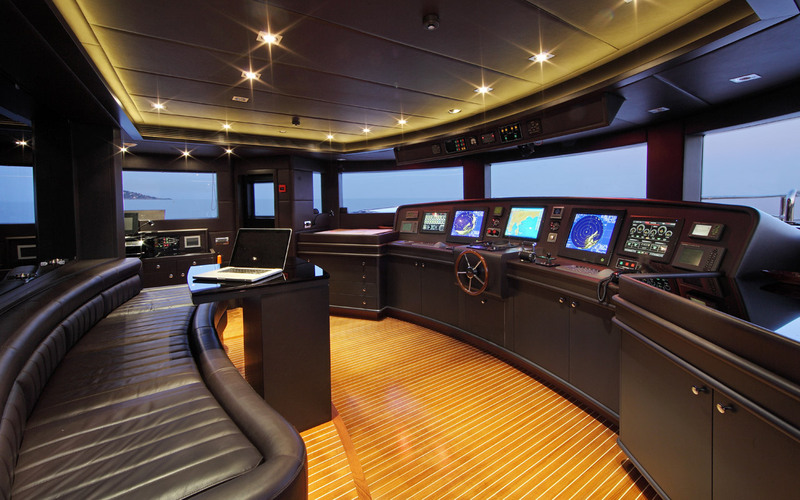 The yacht Told U So also accommodates up to 12 crew members. 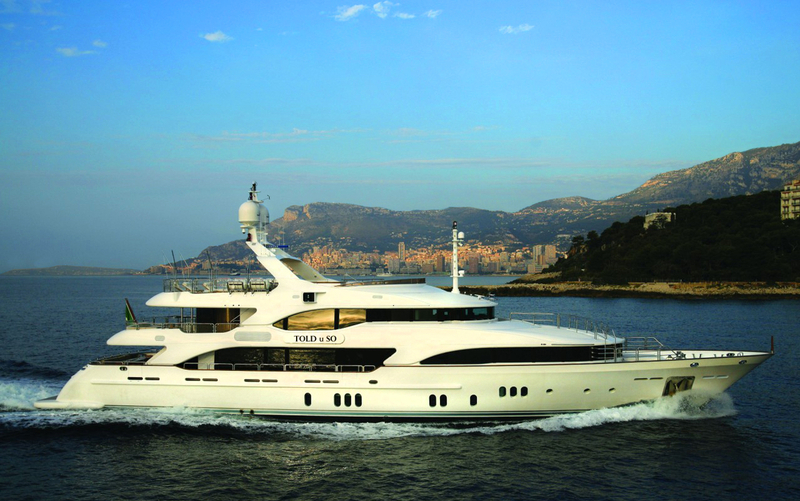 Please contact CharterWorld for a full list of the extras and amenities.